Careers We value our employees as we do our hospital customers and the patients they serve. That's why we work to create an enjoyable working environment that fosters growth. Do you share US Med-Equip’s commitment to the healing process? Do you have “snap”, that combination of passion and drive to achieve? We are a dynamic, expanding company seeking employees who have the skills, desire and dedication to excellent service that helps US Med-Equip compete- and continue to win- regionally, nationally and globally. Even if you don’t see an opening for your area, we’re always expanding our team and invite you to email your resume and cover letter to careers@usmedequip.com. We value our employees in the same way we value our hospital customers and the patients they serve. 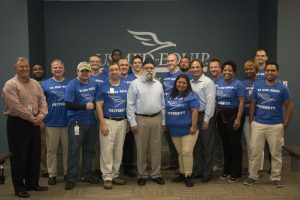 From offering a comprehensive benefits program to personal and professional development and fostering a positive company culture, our goal is to create a working environment that encourages our employees to want to come to work each day. As a proud, diversity-founded company, our heritage is evident in our commitment to diversity with over 64% diversity in our employee base and 50% in leadership. Learn more here. 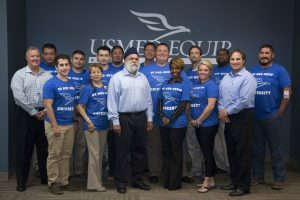 US Med-Equip strives to always improve employee satisfaction through employee development and team-building programs. From our annual Holiday Employee Awards Gala to local outings that have included company picnics, sporting events, volunteer opportunities and more, we work hard to build a family atmosphere. Visit us on Facebook to get a sneak peek into our company culture.